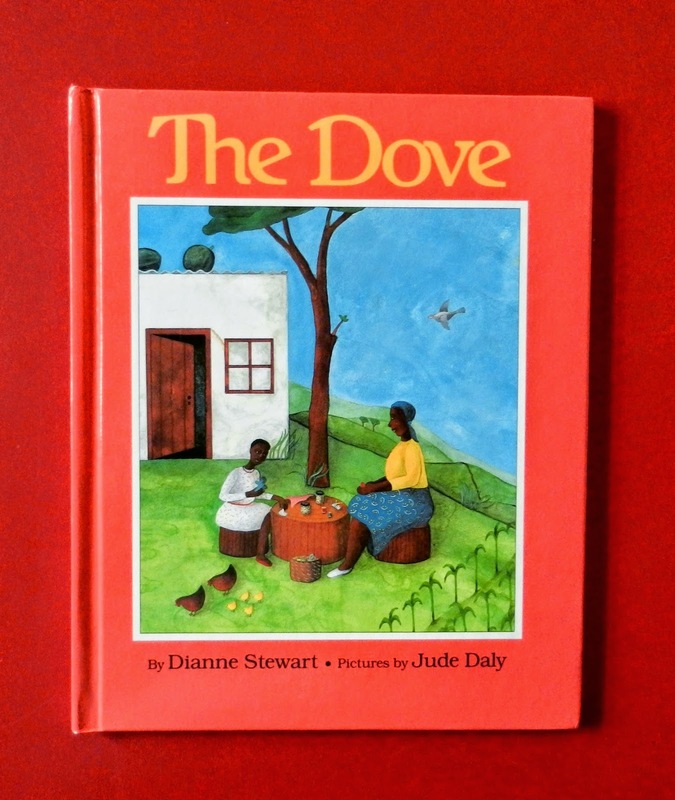 Summary: After crops are destroyed by flood on Lindi’s South African farm, she and her grandmother begin feeding a dove who they liken to the dove in the story of Noah’s ark. To buy new seed for planting and to feed themselves, they make traditional bead jewelry to sell at market, but they are unsuccessful. Then Lindi is inspired to make a beautiful beaded dove, a unique item, which sells easily. As new crops grow, they create new designs for beaded animals and begin to make a good living. Hanna’s Comments: Though this story ties into Noah’s ark, it could be used in a variety of lessons that are unrelated to the flood from the Hebrew Scriptures such as lessons on ingenuity or work, both of which are gifts from God. No matter your topic, be sure to talk about the symbolism of the dove in the Old Testament story and what it might mean to these two characters. Idea(s) for Application: Read this book as part of a program about social justice issues surrounding fair trade practices or fair trade companies such as Ten Thousand Villages or SERRV.org. Summary: This is the story of one orange. It begins as a blossom in a land that glows with warm spring light. It ends across the world, in a young boy’s hands as he shares it with his school friends on a snowy playground. Across the distance, the orange offers its nectar to bees, ripens on a tree, and is picked and placed in a bag, then a basket, then a truck, then a grocery store, then a school lunchbox. At last, the children enjoy the sweet yummy goodness of the orange sections, even in January. Hanna’s Comments: I am guilty of taking it for granted that an orange is available to me in the middle of winter. Use this book to help a young audience savor the beauty of an orange, appreciate the complexity of its route, and taste one of God’s great gifts. Talk about how an orange used to be a very rare treat and still is for many in our world who don’t have the means or accessibility to exotic or off-season foods. Mention the joy of sharing such delights and consider what other treats are worthy of further attention. Then relate these joys to savoring and praising God’s goodness in worship and all day long. Idea(s) for Application: Read this book to a group of children while sharing sections of oranges. Talk about savoring God’s goodness and the importance of praise and gratitude to God. Hanna’s Comments: There are several subtle jokes in this story that you might want to share with your audience. Note the names of the characters. Also, if Mrs. Toggle’s coat used “toggles” as fasteners instead of a zipper, she would not have a problem. There are three aspects of this story that make it a great PBT book. First, the problem is solved in community, with everyone lending a hand. Secondly, the care and concern for Mrs. Toggle is evident. Thirdly, it is the humble janitor who has the smarts here. He is the hero and his practical problem-solving skills are the reason. Idea(s) for Application: Consider reading this book when you want to talk to children in your faith community about God’s variety of gifts and how God wants us to respect and value all of those gifts and use them together to solve problems. Be sure to emphasize our interdependence on one another. Summary: Two boys, living a world apart, can be best friends. In this picture book about pen pals (actually picture pals), Elliot, an American boy, and Kailash, who lives in India, share their lives through words and pictures. They discover that they have much in common (same, same) even though their worlds look very dissimilar (but different). Both love to climb trees, have pets, ride buses to school, and deal with too much traffic. Much is different about their worlds though. Their alphabet is different, as is the number of people in their town and family members in their home. They both greet people, but very differently. Hanna’s Comments: The author learned the popular saying, “same, same but different” while in Nepal and India. Native Nepalese and Pakistanis use this saying when comparing cultures. You might want to spend some time with your audience looking at the illustrations closely so that you can explicitly compare and contrast these two boys. Be sure to look at the postage stamps on the end papers. Maybe your children can guess in which country the stamps originated. Formats other than Book: Tablet, There are videos of this book on Youtube.com, but note that there is a different live-action movie with the same name. Idea(s) for Application: Read this book to a group of children who are studying diverse cultures that are united in their religious beliefs. Summary: Mrs. Biddlebox is having a bad day, but she is determined to deal with it in her own very bewitching way. First she gathers it in a big pot, requiring lots of energy. She even twirls it with her broomstick like spaghetti. She reaches up and hooks some sunrays to add to the pot and rolls up the cloudy gray sky like a vast carpet. Finally, she whips it, whisks it, beats and bakes it. Then Mrs. Biddlebox eats her bad day, every last bite of it. When the meal is finished, she opens her door to welcome in a shining night and goes to bed. It is inspiring to note that the author was a sort of Mrs. Biddlebox in her own right who battled cancer for two years before dying of that disease in June of 2000. Hanna’s Comments: If you are having trouble visualizing the events in this book, then you will be fascinated by the imaginative illustrations. I was also struck with the emotional tone here and the determination of this unusual character. I can see this book creatively used in a variety of settings in which your audience is dealing with a difficult and dark situation that requires energy, stamina, and determination such as a terminal illness, chronic pain, or depression. This picture book could also be used to motivate a religious community who is suffering through a particularly difficult problem such as large debt or a great loss as in a natural disaster or fire. My last idea is to talk about this book as a metaphor for battling evil, whether you see evil personified as the Devil or you see evil in more general, ambiguous terms. Note that the cover of this book as shown above may be different from the one on the book you find. Idea(s) for Application: Consider reading this picture book at a support group for people with situations of clinical depression, chronic pain, or terminal disease. Summary: A boy lands on the first page of this clever picture book. He wonders, “Why am I here?” and “What does it mean?” At first there is nothing, Then a world begins to appear. Comically, he rides a horse, catches a fish, paints a picture, saves an animal, grows up, falls in love…. As his family grows, he looks at the moon sometimes and wonders why he landed on the page. In an attempt to answer this question, he jumps off the page. Again at first there is nothing, but then he tumbles back to the page where he finds “everything he had ever made, every animal he had ever cared for and every person he had ever loved.” Finally, he understands the meaning of his life. Hanna’s Comments: These hilarious illustrations mask a picture book full of meaning and connections to our own questions about how and why our lives are meaningful and important and what happens when we exit. It’s a comforting thought to think that the end of our lives will have us surrounded by those we love and the fruits of our loves and labors. Idea(s) for Application: Read this book to children when studying the story of God creating Adam and Eve. This book would also be a fun read at a family retreat for a faith community. Summary: “The piece sat alone, waiting for someone to come along and take it somewhere.” Many come along, but they are not the right fit or situation. The simple illustrations make this comically clear. The Missing Piece tries to be more attractive, but those plans fail. Then it meets someone who is different, The Big O, a perfect circle with nothing missing. When asked to roll with The Missing Piece, The Big O explains that there is no place for The Missing Piece to fit, but “perhaps you can roll by yourself.” The Missing Piece argues that it is not shaped for rolling. The Big O says, “Corners wear off… shapes change.” The Missing Piece tries it with a strenuous lift and a flop. Sure enough, it works again and again until its corners do begin to wear and its shape changes. Eventually, The Missing Piece, becomes a circle and rolls right up to the Big O. Then they roll together. Hanna’s Comments: Please note the comments in the 1st book in this PBT Dynamic Duo offered yesterday (Day 279). Most suggestions apply here too. Like its predecessor, this book can be interpreted in many ways. The pair of these books also offer a good opportunity to consider empathy and perspective taking. In the reading of The Missing Piece, did your listener’s consider the perspectives of the pieces that were rejected and accepted? This second book offers one possibility. In The Missing Piece Meets The Big O, encourage your audience to empathize with the circles too, especially The Big O. Available in Spanish? Amazon.com did not have it available in Spanish though it may be available somewhere. It is available in Chinese and Korean on Amazon.com. Idea(s) for Application: Consider using this book and The Missing Piece (Day 279), in a marriage or pre-marital therapy context or at a marriage retreat for your faith community. Picture Book: Panda Bear, Panda Bear, What Do You See? Each of these books celebrate God’s diverse creativity as demonstrated in the animal kingdom. How might this book encourage a theological or spiritual experience with toddlers and preschoolers? After reading the book to a small group, go back through Eric Carle’s gorgeous tissue paper animals and talk about how God created each beautiful animal to have different and specific attributes to survive. For instance, “Look at this spider monkey’s long arms and legs. God gave those to the spider monkey so that swinging from tree limbs is easy as can be.” You may have to do a little research about each species, but that can be easily done on the internet. At the end, be sure to talk about human bodies and how they too are beautiful and different and how they allow your young children to do amazing things. Formats other than Book: Audio download, Audio CD (of all 4 books listed above), video on Youtube.com, There is also a board game available based on this and the first book in the series. Idea(s) for Application: Read this book to a group of young children as described above in my comments emphasizing God’s diverse and ingenious creativity. Summary: Sam and Dave begin their mission. They won’t stop digging until they find “something spectacular”. They dig straight down, but find nothing. They decide to dig in another direction, to the side. They dig in that direction for a while and then decide to split up and dig in two different directions. Each time, they find nothing so again they start digging together and straight down. Eventually they rest. Meanwhile, the dog, who all along has been giving hints as to what they are missing, begins digging straight down for a bone. All 3 characters fall through air to another home, an alternative reality of sorts. It looks very similar to the home they left. Upon landing, Sam and Dave declare, “That was pretty spectacular.” Each illustration offers a cutaway view of Sam and Dave’s digging. Every time they change their direction, it is just before they are about to dig up a huge gem! Again and again in comical fashion, they miss a “spectacular something.” However, the characters are wise enough to realize that the journey in itself was spectacular. Hanna’s Comments: The illustrations in this book are crucial to the enjoyment. I’m not just referring to where the huge gems are located, but also the dog’s behavior and the subtle differences between Sam and Dave’s location at the start and where they land. It will be important for your audience to be able to see these details so consider projecting the book on a screen or having multiple books with designated page turners who turn each page just as you do. Pacing is crucial in the delivery of this story. If you are reading to young children, you’ll need to explain beforehand that this is not a story based in our reality, although it seems to start that way. The ending is mysterious and up to interpretation. Encourage them all to interpret and discuss. There are many possibilities. You may want to read the book again after you have talked about it. If you plan to do this, don’t point out things the first time you read it, but do read slowly so that people have time to notice the details. Encourage them to be silent and attentive. Then the story becomes an individual journey, perhaps even “something spectacular” for each audience member. Idea(s) for Application: Read this book to a group of adults when you are talking about the idea of individual spiritual journeys, particularly the value of process over product. Summary: This picture book of Martin Luther King, Jr.’s boyhood is about how segregation affected him personally as a child. It includes his disappointment in not being able to attend school and later play ball with the white boys in his neighborhood. How MLK Jr.’s parents might have first explained racism and segregation to him is depicted here as well as an account of purchasing shoes with his father. When told to sit in the “colored” section of the store, his father refuses, and they leave the store. Conversations about the injustice of segregation continue in young Martin’s family, and he promises his father that he will fight against segregation. Hanna’s Comments: There are many other picture book biographies of Martin Luther King, Jr. I chose this one because it depicts him as a child, first learning of segregation, being detrimentally affected by it, and then being determined to work for social justice in his adulthood. I think children will be particularly drawn to this story. Be sure to ask your audience about the injustices they see now that might stir them toward working for change now and when they are adults. Point out that both MLK, Jr. and his father were ministers who were inspired by scripture to resist segregation in ways that were non-violent. This book includes an introductory note by Alex Haley and another note in the back about the MLK, Jr. holiday. Idea(s) for Application: Read this book to children when doing a scripture-based lesson on justice, righteousness, or non-violence.